Mizuma Art Gallery is delighted to announce the solo exhibition of YAMAMOTO Ryuki beginning on 23rd July 2014. A painter of overwhelmingly vast compositions and intricately detailed self-portraits, YAMAMOTO Ryuki was in 2011 awarded a grant by the Pola Art Foundation to take up an artist’s residency in Beijing. In this, his first solo exhibition in three years, he will show two major pieces: one painted during his Beijing residency, and one since returning to Japan. Firstly, the enormous work “Chaos” painted in Beijing measures 4 metres tall by 3 metres wide. Underpinning its concept is the 13th-century Japanese picture scroll, “Kitano Tenjin Engi”, created out of a religious belief in “Tenjin” (deified spirits) and expressing both the spirituality and awareness of mortality present in Japan in the Middle Ages. 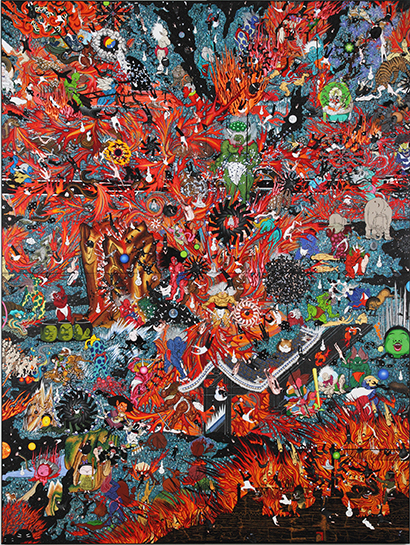 Gods and demons with Yamamoto’s own face, and seemingly infinite numbers of school-uniform-clad Yamamotos fill the main part of the picture plane – creating the exact image of “chaos”. Re-born from the chaos in what might be called a fertile abundance, or an entirely new chaos, the breath of this continually unbroken world of the painting both transcends time and extends into modernity. 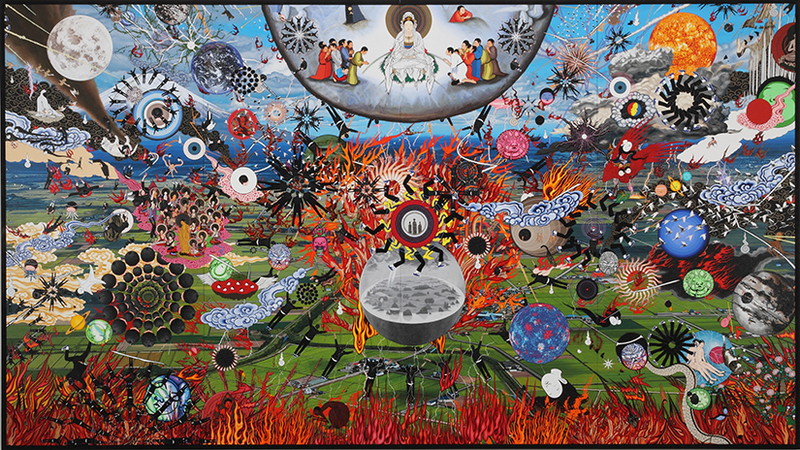 By contrast, his newest work “Heaven and Earth” takes its inspiration from Hieronymus Bosch’s “Garden of Earthly Delights” and “The Last Judgement”. It comprises a backdrop of an idyllic landscape of rice fields and Mount Fuji, onto which a great variety of histories and memories is arrayed, transforming it into a symbolic world. During the exhibition, one room will be designated a small atelier, in which it will be possible for viewers to occasionally see the artist at work. We invite you to experience the unique creations of Yamamoto’s world-encompassing gaze.